Last week we revealed a dramatic kitchen transformation as our next ‘Before & After’ blog series. 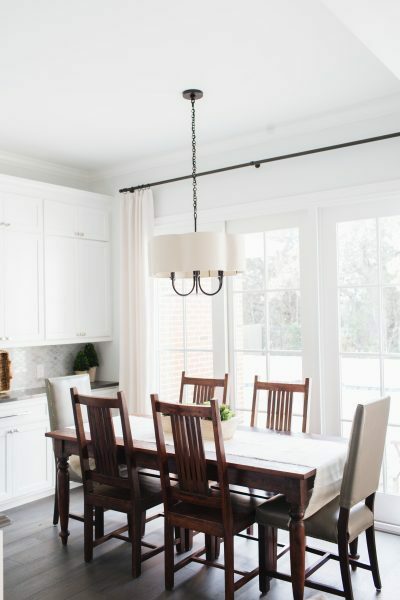 The Barton Creek Remodel kitchen that we introduced you to last week opens up to the casual breakfast room. Today we will the tour this space with you. The goal of the remodel has to make each space flow seamlessly. We wanted each space in the new open concept to have the same light, transitional feel. 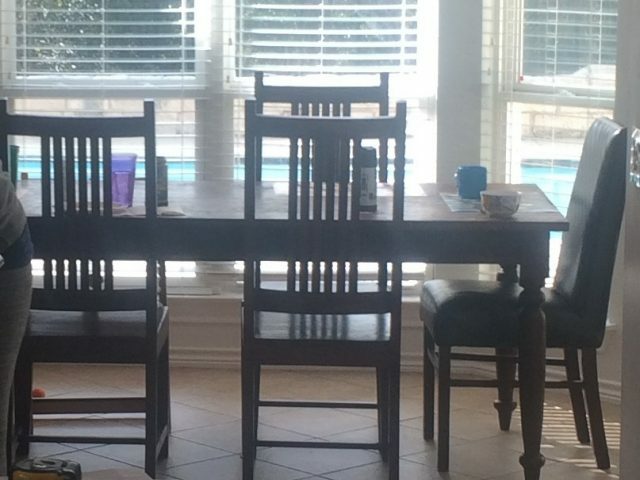 The narrow breakfast room held a long rectangular table. Our client went back and forth on the idea of introducing a bay window with a built-in banquette to comfortably fit the family of 6. However as the design evolved, priorities shifted. The result is still a beautiful and livable space. 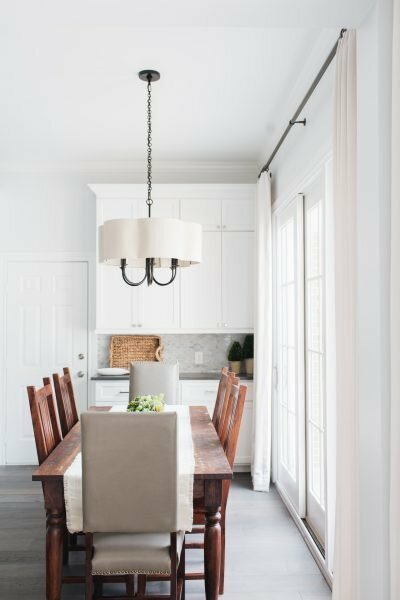 New sliding doors framed by linen drapery panels and a pretty new pendant light soften the rectangular space. It looks fresh and new with a few updates and tweaks. We kept the client’s existing table and side chairs but added the gray leather head chairs. 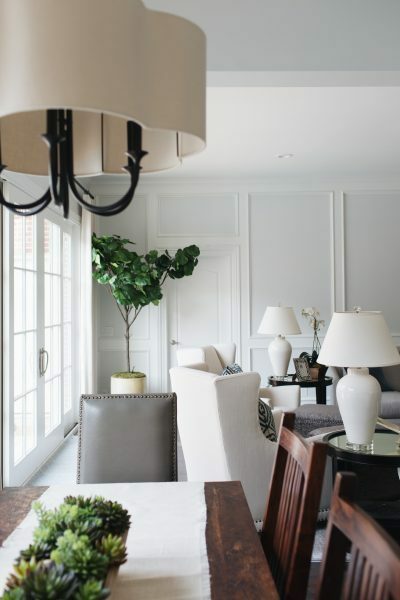 They add a much softer look to the breakfast room than the client’s existing dark leather chairs. Keeping the wooden side chairs are practical for the young family. They are spill and mess proof, which will give the parents of 4 children some peace of mind. 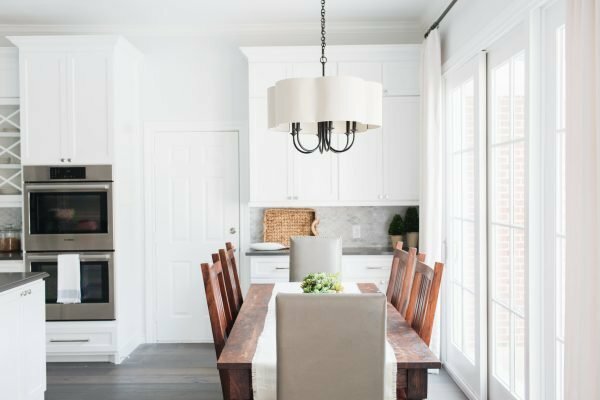 Plus–Design wise the wood tone adds some warmth to the white kitchen. A soft linen runner breaks up the dark wood of the table and chairs. 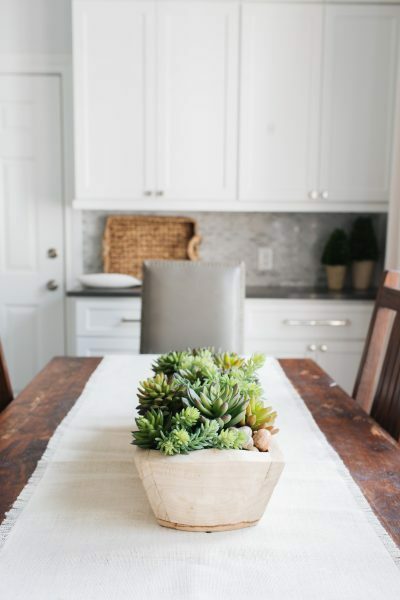 A succulent arrangement adds some greenery to the space. Plus it is an easy and light piece to move during meal times. Oh, and the succulents are faux, which adds another carefree element to the space. 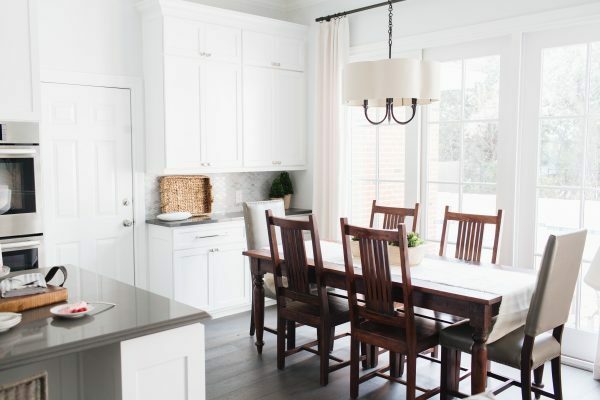 The breakfast room is the perfect casual, relaxed space next to the remodeled kitchen. Here’s a preview of next week’s blog as we continue the tour into the family room. If you have a project you are thinking about, know that we can use your existing furniture and make it feel like new. To learn more about our services follow this link. Continue to follow along as we see more of this Barton Creek home! Where is the link to the remodeled kitchen? It isn’t listed on the “Before and After” page either….